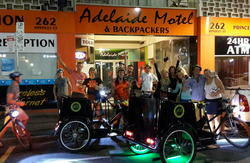 Close to Adelaide's city centre Hostel 109 is a modern well appointed hostel with friendly staff and excellent facilities. 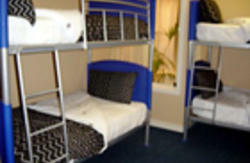 Small, quiet, modern, secure & centrally located, Hostel 109 is the perfect place for your stay in Adelaide. We offer all our guests free Broadband internet access, supplied linen, ready made beds, towels if requested, heating and air-conditioning, laundry and ironing facilities, a 24 hour modern kitchen, security lockers, unlimited hot water showers, and free baggage storage. Best of all? No curfew! Skylink Bus $13.00 one way. Drops off at the hostels door. Take the free Tram outside of the Station to the City South Tram stop. Walk back toward the Train Station for one street and turn right into Carrington Street. Walk along Carrington Street for 350 metres and Hostel 109 is on the right (south). side of the road, look for the blue 'Hostel109' sign in the window. Taxi $10/12.00 dependig of traffic. 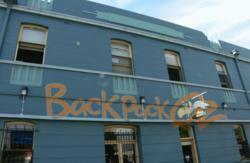 Walk east along Grote or Franklin Street to Victoria Square then turn right (south). Walk through Victoria Square and along King William Street past Gouger Street to Wright Street on the right and Carrington street on the left. Walk along Carrington Street for 350 metres and Hostel 109 is on the right (south). side of the road, look for the blue 'Hostel109' sign in the window.